In a not-too-distant utopian or dystopian future, depending on how you view the relentless encroachment of technology on our daily lives, you may look upwards to gaze at the endless stars and proud full moon, only to see a tuna nigiri and a California roll whirring above your head. Sounds unbelievable doesn’t it? But given the incredible advancement of technology, we might soon see drones, en masse, whizzing around central London delivering sushi to the capital’s hungry mouths. But then again, it’s entirely possible we won’t. Much in the same way as people in the 1950s thought everyone in the 80s would be travelling by flying car, sushi takeaway drones could be just another pipe dream; a completely implausible advancement that while possible, will never be realised. What do Amazon have to say? Amazon are trying to take over the world, so maybe that’s a good place to start to help us a get a better understanding of where drone delivery technology is right now. Believe it or not, Amazon is actually taking the prospect of commercial drone delivery seriously; very seriously in fact. Not only have they trialled their delivery drones indoors, where they’re safe from external factors such as strong winds and curious geese; they’ve also taken their trials overseas, where they have tested commercial drones outside of the lab. It might sound implausible, but Amazon is actually dead set on making commercial drone delivery a reality. Following their early stage trials, the Amazon drone testers returned to the US and requested formal permission from the Federal Aviation Authority to trial their drones from its headquarters outside of Seattle. A letter sent by Amazon CEO Jeff Bezos, sought permission to development their “PrimeAir” delivery program and disclosed Amazon’s vision for the future of drone delivery. When questioned about their progress, Amazon’s head of publicity said that the company believes home delivery by drone will soon be “as normal as seeing mail trucks on the road today”. And what’s more, it wasn’t even the 1st April. As a country of cynics, it’s easy for us Brits to view this development as another example of the American Dream gone mad, just a further example of the because we can, we will mentally that results in advancements being made without any real thought for the practicalities and permutations. Like the noisy neighbour you try to ignore, but know they’re there, just over the fence, doing something daft that will unfortunately impact on you. While many of us would not expect to see such a dramatic sea-change in our lifetimes, Amazon’s Jeff Bezos has put a five year estimate on the project, and has promised to get drone delivery rolled out worldwide as soon as he is permitted to do so. 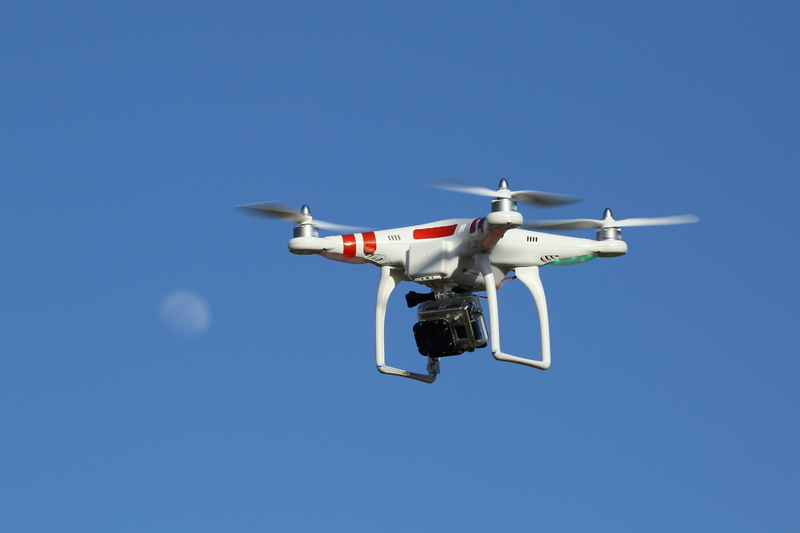 Will we allow drone delivery in British airspace? Will cynical Brits lean out of their windows with catapults and hoses shooting socks, cookbooks and cardigans out of the sky? That remains to be seen. Here in the UK, the Civil Aviation Authority’s resources are already stretched enough regulating the estimated 7,500 flights that travel in British airspace every single day. As such, the CAA is not currently geared up to licence and regulate such a widespread use of drones. Certainly, before you can expect your handmade sushi delivery to be winging its merry way through a window near you, there are one or two potential flies in the ointment, namely: air traffic interference; privacy; and those who are happy to take potshots at delivery drones in the hope of landing themselves a free dinner. Perhaps the most intriguing problem is that of theft. Some commercial delivery drone prototypes have been designed with anti-theft devices onboard, such as hoists that deliver products when the correct recipient is identified. For this to work, prototypes have been fitted with facial recognition and video monitoring technology. Will this advanced level of technology make drone delivery vastly more expensive than conventional means? You’d think so, but you’d have to ask Amazon. What might a sushi delivery drone look like? Pizza deliver giants Domino’s have been hard at work producing this slightly dubious contraption, dubbed the ‘Domicopter’. And while this drone is not out and about in a commercial setting, it does give you some idea of how a commercial delivery drone might work. How about a delivery car with no driver? While we’re on the subject of alternative sushi delivery types, perhaps you’ll soon see a driverless car on the streets of London, choc-a-bloc with raw fish? Here’s a look at the driverless car in action. This vehicle can traverse the pavements to make deliveries to your door. But can ring it doorbell? No, not yet. So, should you expect to see the delicious menu at YouMeSushi delivered to your door by an unmanned craft anytime soon? Well no. For now we’re going to focus on producing the best sushi delivery in London, and leave the technological pioneers alone to do their thing. If anything changes, you’ll be the first to know! This article was posted in Learn About Sushi, Sushi Delivery, Sushi News. Bookmark the permalink.